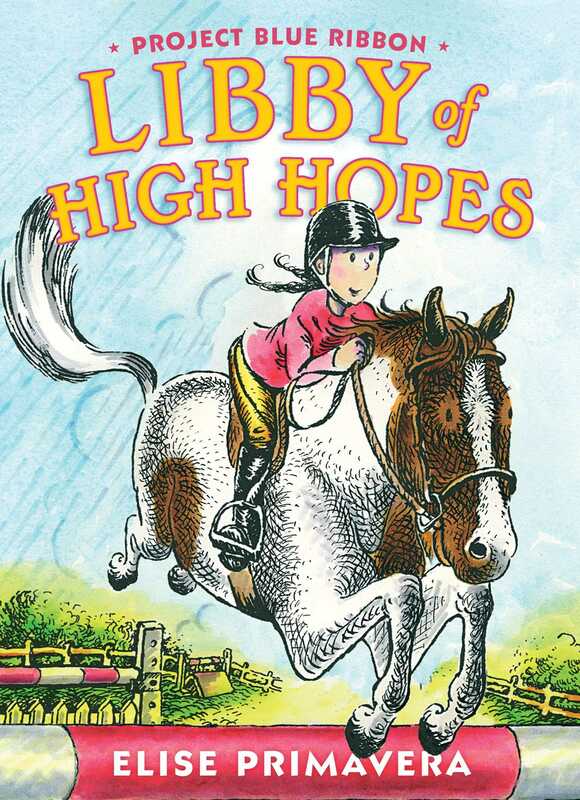 Libby Thump’s life is a perfect mix of horseback riding, art, and her dog Margaret until her resilience is put to the test when she must learn to ride a challenging pony in this chapter book companion to Libby of High Hopes from New York Times bestselling author and illustrator Elise Primavera. 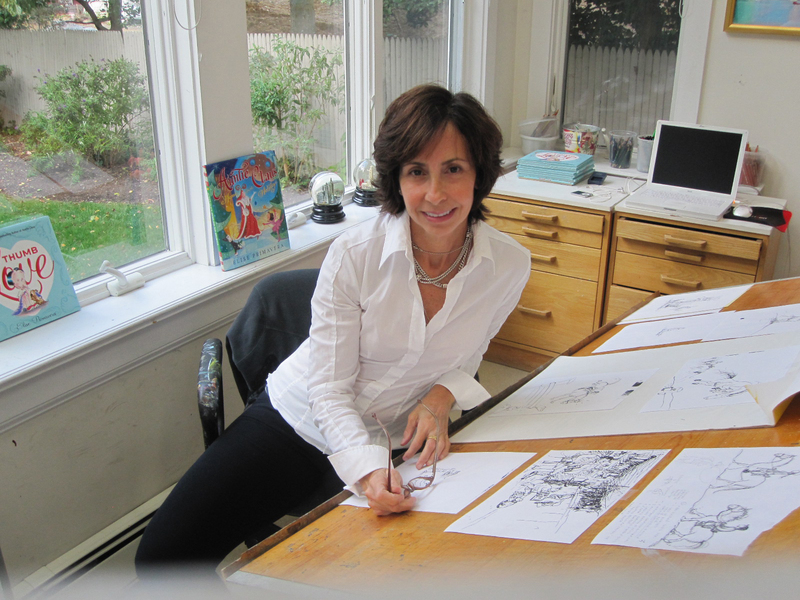 “The second book in the Libby of High Hopes series is as enjoyable as the first” said Booklist. Libby Thump still wishes for a horse of her own, but she’s very happy riding Princess, the aging horse who belongs to Sal, the stable owner of High Hopes Farm. Libby loves Princess and her gentle ways, and Princess loves Libby. Then one day Sal says she has to ride Saddleshoes instead—and Saddleshoes is the most difficult pony at the stable! Sal says Princess is too old to be ridden much longer and that Libby is outgrowing her, so Libby is stuck: ride Saddleshoes, or don’t ride at all. But Libby is nothing if not determined, and so she decides that the only way to live up to her potential and achieve her dream of being the best rider in the world is to try something new. Can she find a way to win a blue ribbon riding Saddleshoes? Libby Thump wished for a blue ribbon. A satin royal blue ribbon with a rosette and the words “First Place” written in gold lettering. There was going to be a horse show in three weeks and that’s exactly where she hoped to win one. Libby was excited because Sal, who owned High Hopes Horse Farm, was supposed to tell her today if he thought she was ready to ride in the show. She sat on the floor of her bedroom trying to pull on her left boot. “Come on,” she said impatiently, but it wouldn’t budge. She’d grown an inch since last summer and the riding boots that had been handed down from her sister were beginning to get tight. She yanked off the extra pair of socks that she’d always worn and pulled on a pair of thin ones. It did the trick and her foot slipped into place. She jumped up and reached for her riding helmet, when something caught her eye. Libby tilted her head and squinted at one of the many drawings of Sal’s retired show horse, Princess, she’d taped to the wall. She suddenly noticed for the first time there was something wrong with the way she’d drawn the white mare and grabbed an eraser and pencil off her table to fix it. “In a minute!” Libby called back. Margaret gazed up at her and wagged her tail expectantly. Libby got the leash—the drawing would have to wait—but as she turned to leave she caught a reflection of herself in the mirror. There were the same long dark braids, dark eyes, and oval face, but in her boots and jeans and quilted vest she looked like a real rider! Libby wondered what her fourth-grade teacher from last year would think of her now. Libby remembered what Mrs. Williams had written on Libby’s report card the last day of school. Libby needs to apply herself. Sometimes she does not pay attention or follow directions as well as she should. Libby needs to live up to her potential! Back then Libby wasn’t even sure what potential was. By now she had memorized the meaning of the word: “something that can develop or become actual.” Libby knew just what that “something” was, too; she was a rider! It was what she was meant to be. She just hoped that she had the potential to someday become a really good rider. She thought she could feel it in there, just itching to get out! Sure enough, a lot had changed since Mrs. Williams’s class. Throughout the fall and all winter Libby had been riding Princess, and she was even learning to jump. Libby moved her face closer to the mirror. She sucked in her cheeks and tried to imagine what she would look like when she was grown up. Would she be a really good rider by then? Did she have what it would take? “Libbyyyyy!” her mother called again. Below the horse nickered and soon there was a thunder of hooves. The white mare’s mane whipped in the wind as she galloped up to meet the girl. She skidded to a stop and nudged Libby’s pocket for a carrot. Libby jogged down the hill and Princess followed behind like an enormous dog. There was the smell of damp earth and new grass. All winter Libby had been looking forward to spring and now it was finally here. She breathed in deeply and sighed. The sky was blue and the air was just beginning to have the first hint of warmth. At the gate she grabbed the halter and slipped it over the mare’s nose. “This has to be our best lesson yet, Princess!” Libby knew that she would have to ride extra-specially well this day in order for Sal to think that she was good enough to compete in the horse show. As soon as they entered the barn Brittany poked her head out of a stall where she was tacking up Summer, the horse she always rode. Libby’s and Brittany’s moms were best friends and that had automatically made Libby and Brittany best friends since they were babies. They’d had a “misunderstanding” last year, but now Libby was glad they were best friends again. “Yep!” Libby grinned as she passed. At the end of the aisle was one of Sal’s boarders, Mr. McClave and his horse, General George. “Hi, Mr. McClave!” Libby shouted. “All ready!” Libby answered, and secured Princess to the cross ties. She hurried to the tack room. A blond curly-haired woman in jeans and hacking boots bustled down the aisle with several flakes of hay that she threw into stalls. Emily was Sal’s wife and helped him run the stable. “Hi, Emily!” Libby called to her. “Great!” Libby grabbed her saddle and bridle and felt the butterflies in her stomach that were always there right before she was to have a jumping lesson. She still couldn’t pass by the photos in the tack room of Sal riding the big white horse over the gigantic fences without getting goose bumps. Now here she was, Libby Thump, jumping Princess herself. She was so anxious to get out to the ring that it was all she could do to take the time to pick out each of the mare’s hooves and then brush her off and tack her up. Libby’s fingers nervously fumbled with the snaps on her riding helmet. All ready, she led Princess down the aisle. She wanted everything to go well this afternoon. Outside Libby could see that Brittany was right. There was Saddleshoes. With his dazzling white legs, brown spots on his neck and rump, and a handsome blaze down the front of his face Saddleshoes was the best-looking pony around. But . . . as far as Libby was concerned he was also the worst pony there ever was. Libby entered the ring careful to steer Princess far away from him, for he could deliver a mean kick. Suddenly there was a gust of wind and Saddleshoes spooked to the side. Somewhere the sound of a tractor started up and he shied and tried to buck.